Streaming games (and watching others do so) has become a huge part of everyday life for millions of gamers. We regularly tune in to watch major esports events, connect with our favourite streamers or learn about the latest champions and how to play them better. 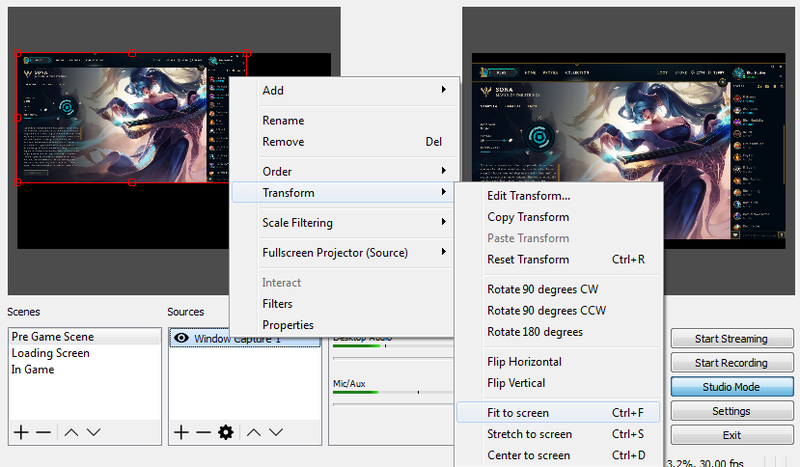 In this article we aim to provide you with the knowledge and tools to stream League of Legends and help you explore software options, platforms and technical requirements that will allow you to stream. Want to focus on educational and informative streams like TheOddOne or Krepo? Or would you rather be a personality streamer like Imaqtpie or Trick2G? Whatever your level or aspiration, streaming can become a way for you to broadcast your play to a few friends or even a passionate worldwide audience. We hope this article will provide you with the information necessary to go from dreamer to streamer in the quickest time possible. Let us guide you through types of streamers, platforms, technical requirements and all other relevant information you need to get started. Depending on what you want to achieve through streaming there are a variety of ways for you to engage with your audience. Whether your goal is to educate players on how to get the most out of a certain champion or role, provide an engaging and entertaining way to broadcast League to your audience or simply run up a crazy KDA against bots you have a wide range of ways to connect with other players. Below are some examples of high-profile streamers who have focused on both providing commentary and pertinent information and others who let their charm and personality shine through. Bjergsen: The incredible Danish pro, Søren Bjergsen Bjerg is the mid laner for Team SoloMid in the North American LCS. His in-depth macro knowledge and mastery of champions like Cassiopeia, Syndra, Ryze and Azir have cemented him as one of the top mid laners in the world. Bjergsen regularly provides commentary on his match ups and provides context on roams, lane control and counter match ups. TheOddOne: Brian TheOddOne Wyllie was the starting jungler for Team SoloMid from 2011 through to 2014 and is most famous for popularizing jungle Maokai. He provides detailed analysis during most of his games, explaining jungle pathing, optimal runes and masteries and gank opportunities TheOddOne is commonly regarded as a great streamer to watch if you are learning how to jungle and want to grasp the basics quickly. Imaqtpie: Michael Imaqtpie Santana was a long-standing member of Team Dignitas in the North American LCS in the role of Marksman. His stream is one of the most popular on Twitch and he’s famous for his play on Heimerdinger whom he referred to as ‘The Donger’ which popularised the phrase ‘Raise your Dongers’. His stream focuses heavily on his interaction with the audience and duo queuing with other famous league personalities like Dyrus and Scarra. Box Box: Albert Box Box Zheng is a streamer who plays the top-lane role and is famous for his love of Riven. Not only did he achieve Challenger maining Riven but he also cosplays as her quite regularly. He is known for his epic yelling and screaming in a high-pitched voice while on stream. BoxBox has a loyal following on Twitch and engages often with his audience there. Now that you’ve decided what type of streaming you want to focus on, we can now take a look at the different platforms available to you. What Platforms Can I Stream On? There are a growing number of successful streaming platforms that allow veteran to new streamers access to an audience. In this article we will focus on some of the most popular sites and listing some up and coming alternatives. The choice of streaming platform is entirely your decision. Twitch is easily the most popular streaming site for League of Legends players and other gamers. Owned by Amazon, it makes it easier for players around the world to share their passion and communicate with each other while playing. Many esports tournaments use Twitch and the platform is steadily shifting towards supporting larger streamers and events. YouTube launched its very own video streaming service that allows users to connect and share their gaming experiences. The ‘Stream Now’ option is a quick and easy way to go live and the service allows for creation of highlight clips and managing live chat. Facebook has entered the streaming market with Facebook Live which allows gamers the opportunity to stream directly to their friends list and beyond. Facebook Live is available to all profiles and streams directly to your News Feed. In addition to the platforms listed above players have a host of other alternatives. Feel free to check them out: - Hitbox, Azubu, Dailymotion and many more. Getting started is really easy! 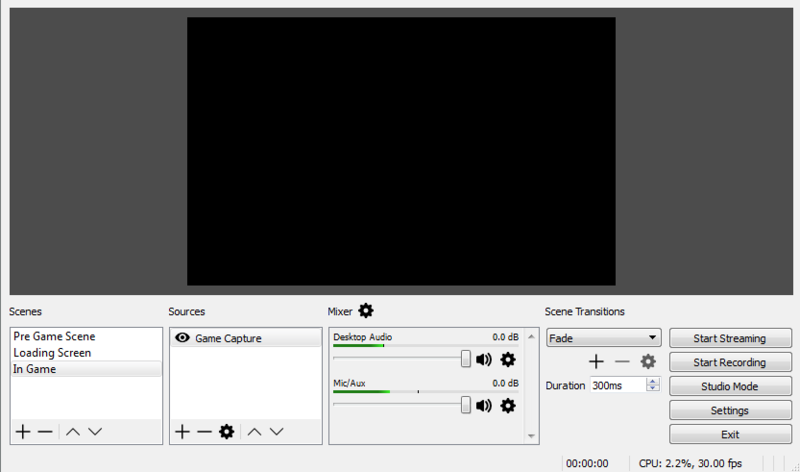 For the purposes of this tutorial, we’ll be focusing on Open Broadcast Software (OBS Studio). The first thing you’ll need to do is download your copy of OBS Studio, which you can do here. Complete the installation process as standard and then start up OBS Studio. With OBS open on screen, click file and settings. This will open up your control panel and you’ll be on the default “general” tab. The only thing you really need to worry about here is making sure you’re happy with the language and theme settings of your OBS client. This won’t affect your stream in any way. As we discussed earlier, you have a choice of platforms from which to stream. In this example, we’ll use Twitch. It’s worth noting before we go any farther that the process of setting up for other platforms is very similar. Step 1: Head over to www.twitch.tv and create your channel. Step 2: On Twitch, open your Dashboard. From here, click on the Stream Key tab. Step 3: Click on “Show Key”. This will show you your unique stream key, which is what links your stream software (OBS) to your stream platform (Twitch). Do not share this key with anyone or they’ll be able to stream on your channel! Step 4: Go back to OBS. Under settings, go to “Stream”. From here you need to select your Service, in this case that is Twitch. Next you need to chose your server. Ideally you should choose a server that is the closest to your location geographically. Finally, paste your stream key from the Twitch Dashboard into the “Stream Key” are as show below and hit apply. At this point, you’ve linked your broadcast software on your computer to your Stream Channel. Feel free to look through the other settings options, but at this point you don’t need to adjust any other settings in order to begin streaming! Scenes: A scene can refer to an individual game setup that you wish you stream. So for example, you may have individual scenes for you most played/streamed games that will have different overlays and settings. 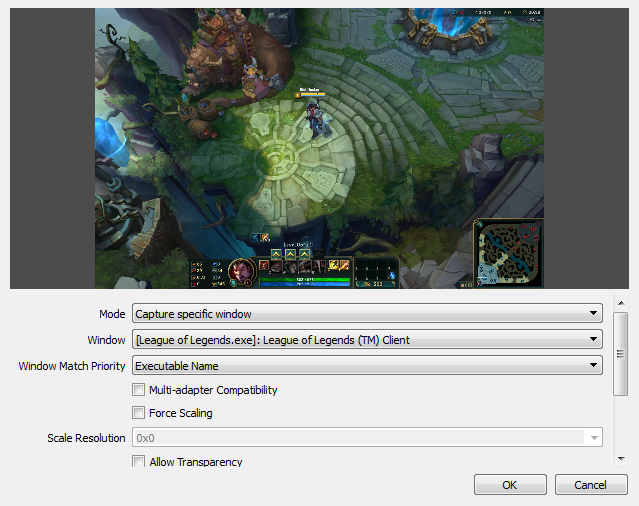 For now, let’s focus on getting you setup to stream League of Legends. It's important to note and understand that sources operate in layers. This means the order in which they are laid out makes a huge difference in what is displayed on stream. We’ll explain how to setup sources shortly! Mixer: Your mixer determines what sound sources are output onto your stream, based on what OBS can detect on your computer. You can adjust the individual volumes of game sound, microphone sound, music players etc from here. Start Streaming: Pretty simply, this button starts and ends your stream. Start Recording: You can also choose to record your stream to your PC by hitting this button. Studio Mode: The best way to use OBS. Studio modes lets you preview scenes before you make live updates. This is very useful if you need to change any text or images in your stream on the fly. We recommend keeping studio mode open at all times. Settings: You’ve already been here! It’s a shortcut to settings path we followed earlier. It’s Time To Create Your Scenes And Sources! Before doing anything on OBS, create a folder on your computer where you can store any images, videos and sound files that you might end up using while streaming. This makes it a lot easier to create different scenes as you get more accustomed to streaming. Step 1: Start Up the League of Legends Client and log in. 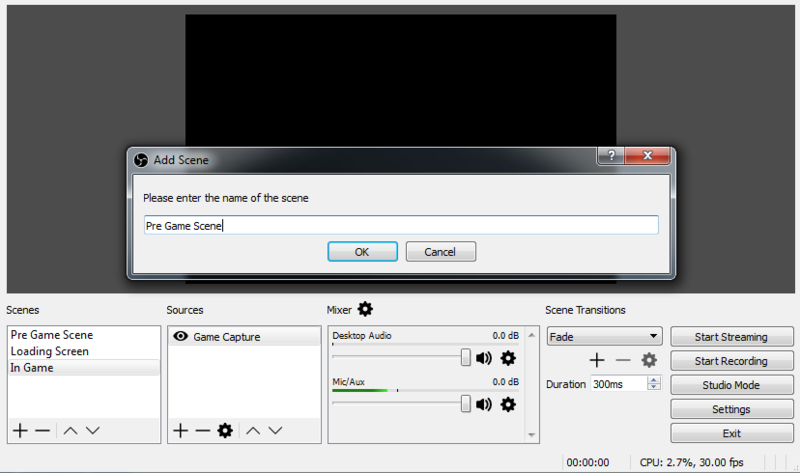 Step 2: On OBS, go the the scenes box and hit the plus button as shown below. You can name the scene anything you wish, but in this example we’ll be showing you how to capture the client/pre-game scene so that’s what we’re calling it. Step 3: Now, click on the plus button under the sources panel, followed by window capture. Name it anything you wish, but we recommend something like Client Capture. Now hit OK.
A pop up will appear and you need to select which window you wish to capture by clicking on the dropdown menu “window”. 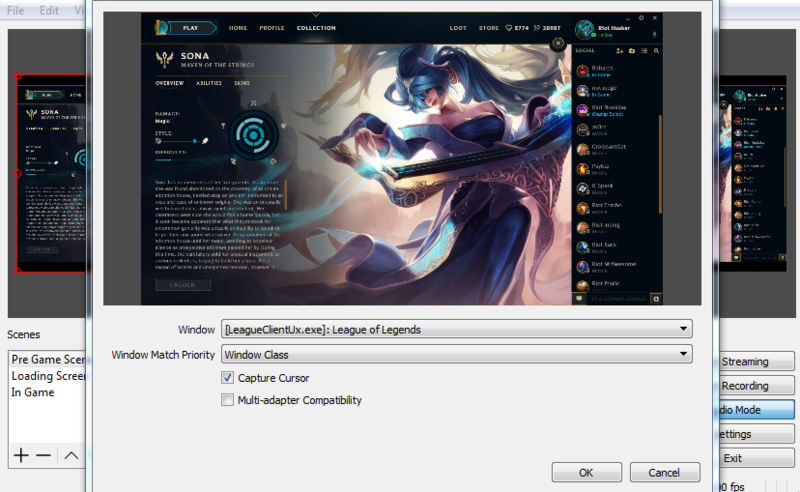 Simply select League of Legends as shown in the image below and hit OK.
#ProTip - From here you can disable “Capture Cursor”. This means that when you’re streaming, your viewers won’t see your mouse moving across your screen. This is entirely optional. Step 4: On the left (preview) screen you’ll see your League of Legends Client. But it’s probably off centre. This will depend on what resolution you have on your screen and what resolution your client is set to. By right clicking on the preview screen, inside the red “edit box” area, you can make a lot of adjustment to the image. Check the example below. For now though, we’re going to simply centre the image as shown below, but feel free to experiment with the various other options you find here. It’s important to note that just because something is on the preview screen doesn’t mean it’ll be seen on stream. If you want it to be seen on stream, you’ll need to hit the transition button which sits between the preview screen and the live screen. Now that you’ve setup your pre-game scene and source, let’s look at the loading screen and in game scenes and source. Step 5: Create a new scene, just liked you did in Step 2 and call it something like "Loading Screen". Step 6: Now that you've done that, create a custom game of League of Legends so you can verify that you're able to capture the loading screen, by capturing the window just like you did in Step 3. Step 7: Remember that you’ll need to manually switch between scenes for the stream to update. Step 8: Repeat Steps 2 above, but this time name the scene “In Game”. Step 9: While you’re in game, create a new source. Add “Game Capture” and match the following settings below. You may need to click on the “Window Match Priority” once for the game to pop up on screen. You'll only ever have to do this the first time you create your sources. We also recommend playing in “Windowed Mode Borderless” which you can find in the video settings of your game. At this point your stream is ready to go! Feel free to try some test streaming now so you can get the hang of switch scenes. OBS also has hotkey functionality to make this more seamless. Check it out in the settings area. If you want to make your stream look a bit sleeker you can always add an overlay to your broadcast as well as some custom text. Step 1: Get into a custom game of League of Legends and load up your In Game scene. Step 2: Create a new source in the “In Game” scene by adding an image and selecting your overlay file. Step 3: If it’s not already, make sure that your overlay image source is above your game capture source. Remember, sources act like layers. So if your overlay image was beneath the game capture, you wouldn’t see the overlay as the game would entirely cover it. Some overlays are set to work with a HUD and Map of a certain scale. If it looks like your overlay doesn’t fit, even after you’ve adjusted it’s size and placement on OBS, try adjusting your HUD and Map size in the in game interface. Using the same method as above, you’re able to add other custom images to your scene, as well as video and audio as you require. Experiment with these options and you’ll have the hang of it in no time! In most cases, overlays are made by comissioning a graphics artist and as such, carry a cost. To get you started, we've created a set of generic overlays that you and your friends are free to use at any time! You can download them directly from here for use with whichever broadcast tool you wish. We've also included the original source files so that you can edit these overlays if you wish. One thing to be aware of is that we do not authorize the reselling of these overlays. Each Streaming Platform and Broadcast Program will have their own minimum requirements which are worth reading up on if you’re unsure as to whether or not your computer is up to the task. Fortunately, basic streams don’t need the most powerful of machines, so you’re probably going to be ok to get started. One thing that we do recommend however is having a minimum of 2mbps up/down, uncongested connection while streaming to deliver a smooth Standard Definition stream. HD streams would need around 5mbps up/down while 4K streams potentially need 15mbps up/down. Can I Use Any Music? Most forms of music require a specific licence in order to be part of any broadcast. As such, if you play unlicensed music, your streaming platform may mute your stream. There are however many free alternatives, such as all the music available on our Soundcloud where you can find here. Our support team can't help with specific issues you may be having with 3rd Party Services. We recommend browsing the help section on whichever website supports your applicaiton.